Makita has introduced two new 18V LXT 5-piece brushless kits which represent a substantial saving by comparison with individual purchases. The new DLX5042PT kit contains a combi drill, impact driver, angle grinder, rotary hammer and a handy LED flashlight and is packaged as the 5-piece construction kit. The Makita DHP484 combi drill will run up to 2,000rpm in high mode, 500rpm in low mode, with an impact performance of 30,000ipm in high and 7,500ipm in low modes, with a maximum torque of 54Nm with 21 settings and drill mode. This combi drill will punch a 13mm hole in masonry, and with all-metal gear box and aluminium gear housing is ideal for rugged site operations. The compact DTD153 single-speed impact driver produces 170 Nm of torque, 3,600ipm, with a no load speed up to 3,400 rpm. This model has a ¼ in. hex; one-touch chuck, an electric brake, variable speed control trigger, and as with all power tools in this kit, the DTD153 features a brushless motor for longer runtime, less friction and more torque. Also contained in this comprehensive kit is the DGA456 115mm angle grinder which will run up to 8,500 rpm with a maximum 6mm wheel thickness. It features Automatic Speed Control which changes the cutting speed according to the load condition. The powerful DHR242 SDS+ rotary hammer will punch a 24mm hole into concrete, 13mm in steel and 27mm in wood. It will run up to 950rpm and generates up to 4,700 blows per minute with 2.0 Joules of impact energy. The second kit is the DLX5043PT more suited to woodworking applications. This kit features the combi drill, impact driver and flashlight contained in the DLX5042PT kit together with a circular saw and jigsaw. The Makita DHS680 cordless circular saw produces 680 watts of motor power that will run the 165mm blade up to 5,000rpm without load and also features Automatic Speed Control. Maximum cutting depth at 0° is 57mm; 41mm at 45° and 37mm at 50°. A large lock-off lever fixes the cutting angle. In operation a blower function blows sawdust off the cutting line for a clear view of the blade path, and Makita recommends that a rear dust port should be connected to use a dust extraction system. The DJV182 jigsaw will run from 800 up to 3,500 strokes per minute with a 26mm stroke length giving a maximum cut in wood of 135mm, 10mm in steel and 20mm in aluminium. The rigid aluminium base bevels 0-45°, both left and right. For safety, after the trigger is released, the machine will lock automatically if the lock-on button is not pressed within 10 seconds. 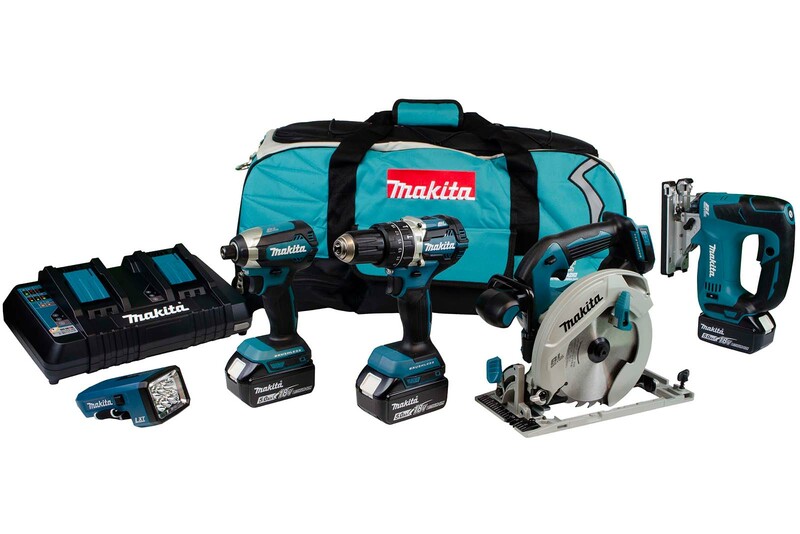 Both new Makita kits provide a financial saving over buying the products individually and are supplied complete with three 18V 5.0Ah Lithium-ion batteries and a twin-port fast charger. The tools are packaged in a rugged, flexible tool bag that has a shoulder strap, handgrip and very useful trolley wheels and an extendable handle for ease of transport of your tools whilst keeping them safe.